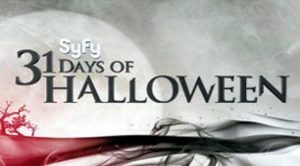 The scare is everywhere during Syfy’s 31 DAYS OF HALLOWEEN! All October, the network will unleash a mix of spooky Syfy originals and nightmare-inducing horror movies, in a cross-platform celebration of the most wickedly wonderful time of the year. 31 DAYS OF HALLOWEEN highlights include the premiere of Syfy’s original anthology series CHANNEL ZERO: CANDLE COVE, on Tuesday, October 11th at 9/8c. Based on a popular “creepypasta” story shared on the internet, viewers will want to keep their nightlights on for this chilling tale. The spook-a-thon also features the Syfy movie premieres of horror favorites “Sweeney Todd: The Demon Barber of Fleet Street,” “The Texas Chainsaw Massacre,” “Zombieland,” “The Strangers,” “Cabin in the Woods,” “Wrong Turn,” “Maleficent,” “I, Frankenstein” and “Drag Me to Hell.” Additionally, audiences will discover new scares with five original Syfy fright films airing Saturday nights, including THE CROOKED MAN, STAKE LAND 2 and THE NIGHT BEFORE HALLOWEEN. New episodes of VAN HELSING, AFTERMATH and Z NATION will also continue to air throughout the month. To accompany this terrifying cache of programming, Syfy will feature blood-curdling Halloween lore, as well as horror movie trivia on air throughout the month. The network will also plunge viewers into the middle of the action at Universal Studios’ “Halloween Horror Nights” with on-the-ground fan interviews. Syfy.com and its editorial arm, Blastr.com, will offer a veritable Halloween editorial graveyard, with daily Top 13 lists, party tips to make your guests scream and horror trope bingo cards, along with interviews with genre insiders. On the network’s social channels, viewers will be asked to submit their best costumes, screams and holiday décor – and the most frightening entries will be featured on-air and on Syfy’s official Snapchat and Instagram Stories of the Week. On Monday, October 31st at 7/6c fans can celebrate Halloween with Syfy’s social team as they take them inside the New York City Greenwich Village Halloween Parade on Snapchat, Instagram and Twitter. Singing a nursery rhyme summons a demonic figure known as Crooked Man. Once you sing the rhyme, everyone in the house is cursed to die by his hands. Original Syfy Movie — Some years ago, the world experienced a “day of reckoning” when creatures came up from below and purged humanity of evil… now, it is happening again. Syfy Original Anthology Series — CANDLE COVE centers on one man’s obsessive recollections of a mysterious children’s television program from the 1980s and his ever-growing suspicions about the role it might have played in a series of nightmarish and deadly events. From Universal Cable Productions (UCP), CHANNEL ZERO: CANDLE COVE is from showrunner and executive producer Nick Antosca (“Hannibal,” “Teen Wolf”), who wrote the CHANNEL ZERO pilot, and Max Landis (“Chronicle,” “American Ultra”). The six-part anthology series will continue on Tuesdays at 9/8c through November 22. Vampires have evolved, and Mister must save a young woman from an evil brotherhood. Original Syfy Movie — A group of teenagers try to escape a creature that lives among the shadows and is hunting them down one by one. When a Halloween prank goes wrong, it unleashes a creature that will hunt each of the participants down and kill them, unless they can figure out how to transfer the curse to someone else. More details including the full schedule coming soon!